Water Requirements: Low water needs once established, but looks its best with some supplemental irrigation. Commonly referred to as Indian hawthorn, this rose relative is an evergreen shrub that grows naturally into a round, mounded shape without pruning. While plants best bloom and resist disease when planted in full sun locations, they can tolerate some late-afternoon shade. Indian hawthorn make excellent evergreen foundation shrubs and typically produce flowers ranging color from white to pink. 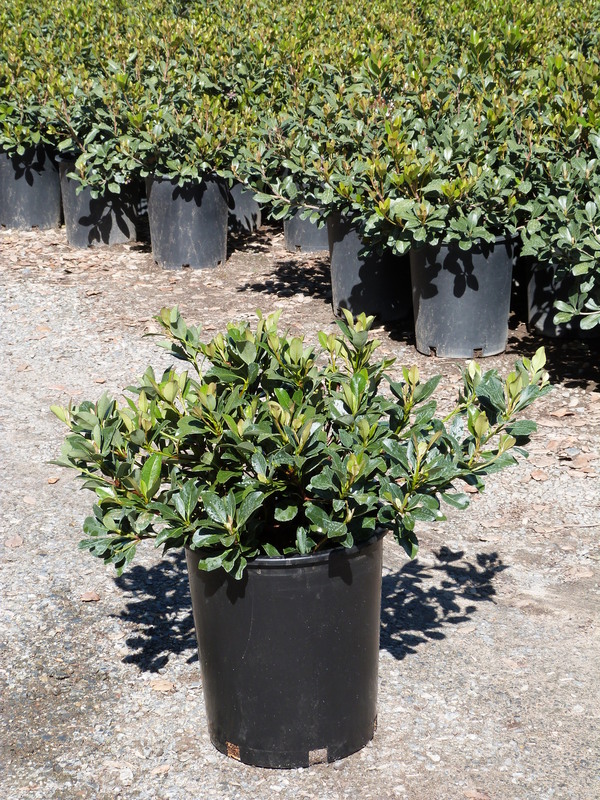 ‘Clara’ is a particular favorite of landscapers, and those of us here at T-Y Nursery, due to its dense, neat growth habit and masses of small white blooms. ‘Clara’ is a reliable cultivar that has good tolerance to the fungal disease Entomosporium leaf spot. Fungal diseases can be a problem if plants are overwatered or experience high levels of humidity. ‘Clara’ will often bloom from late-winter through fall, making it an excellent long-blooming accent for landscapes.